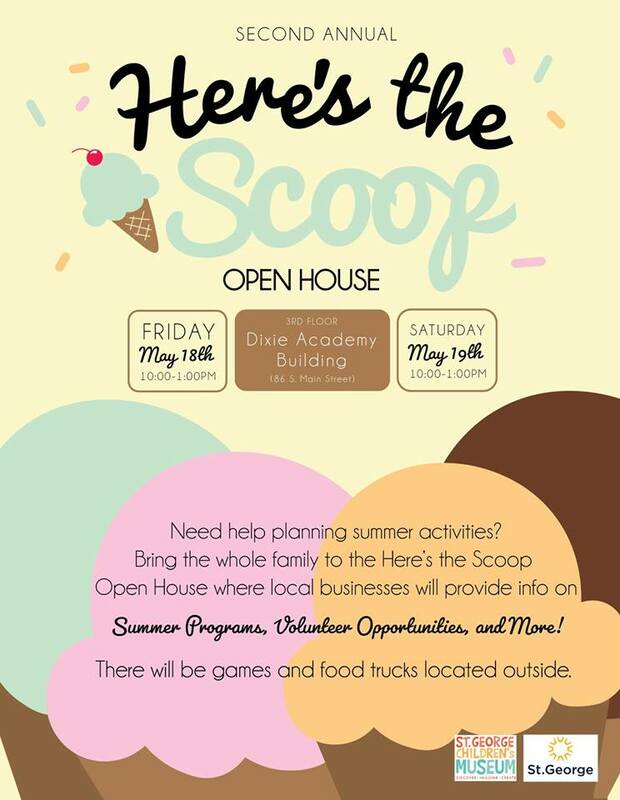 ST. GEORGE — Local businesses and organizations will provide information about summer programs volunteer opportunities and a lot more during the “Here’s the Scoop” open house to be held on the third floor of the St. George Children’s Museum. Attendees can get ideas on summer time activities and classes. From “Girls Go Digital” and the St. George Dinosaur Discovery Site at Johnson Farm to The Learning Center for Families, this free event will provide information about the many activities that will be available in Southern Utah this summer. Rufus, the Children’s Museum mascot, will make a special appearance during the event, and games and food trucks will be located outside. Co-sponsored by the city of St. George, attendees will receive 20 percent off museum admission. When: May 18-19 from 10 a.m. – 1 p.m. Details: Free admission, the public is invited.